In 2012, Blasterjaxx was able to show their true nature and proved to be everything but an ephemera. Together with D-Rashid they produced the Reborn EP with two tracks: Reborn and Where We Go. An EP-name with a story behind it, for this EP is in fact symbolic for Blasterjaxx’ renewed sound, which they want to introduce and conquer the worldwide audience with. A rebirth that eventually turned out to be a bombshell, because none other than Laidback Luke was eager to sign the tracks at his own label: Mixmash Records. 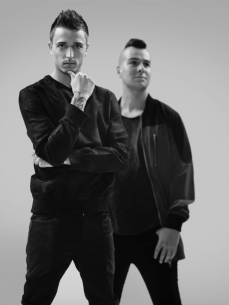 Many successes and milestones followed which resulted in the fact that Blasterjaxx are now seen as one of the most promising EDM artists in the world. Something Thom & Idir are very down-to-earth with, but the facts don’t lie. For example Tiësto asked them in person to remix his worldwide hitsingels 'Adagio For Strings' & 'Love Comes Again'.